It's most unlikely that the lovely Jessica Alba was consciously channeling the Elizabethans when she wrapped her scarf around her neck like a ruff. But the visual and sartorial effects are so similar. The face is framed, the neck stays warm, and a ring of color or lace above the collarbones subliminally denotes nobility. Anyway, if you're interested in the historical precedents for this look, there is a great visual gallery of ruffs here. If you're interested in actually recreating an Elizabethan ruff with a ring of linen, a starch water bath and a curling iron (! ), instructions are here. If you simply want to wear one of your scarves in a fetching way, wrap it around ruff-style. The best materials for this treatment are chiffon, gauze, and cotton web (seek out army-surplus scarves--also known as scrim scarves or shemaghs), which will provide volume without weight, which, as the days warm, is exactly what you want). 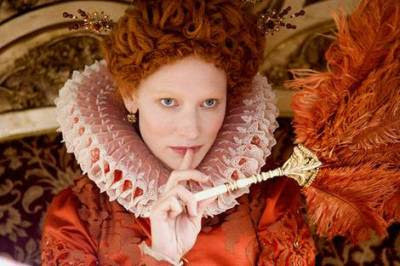 I rather like the Elizabethan look, though not very practical - how d'you wash ruffs? Don't suppose that was much of a concern all those years ago... eeek!